Hasselblad today announced the X1D, the first “mirrorless medium format camera.” At 725g this is a very small and light camera for the large sensor size. That’s only about 100g more than the Sony A7rII. Without lens, the X1D is US$8995. The X1D uses the Sony 50mp CMOS sensor and is 4:3 in format. The camera supports ISO values from 100 to 25600 (plus Auto). Video is supported at 1080P at up to 30 fps (25 fps in Europe). Out back there’s the usual 3” LCD, but with Hasselblad’s new touchscreen menuing/settings system (similar to some recent Leicas). The EVF is XGA sized (2.4m dot) and refreshes at 60 fps. Hasselblad claims 14-stop dynamic range stored in 16-bits, and supports JPEG, TIFF, and 3FR raw files. Surprisingly, the camera has both Wi-Fi and GPS built in, as well as USB 3.0 for tethering purposes. Hasselblad is also claiming dust and weather proof, though there are no specific claims as to what that means (no IP ratings). Hasselblad will initially produce a 45mm f/3.5 and a 90mm f/4.5 lens for the system, with the promise at least another to be announced at Photokina. The 45mm lens is US$2295, the 90mm is US$2695, so just getting a functioning camera with one prime is going to set you back well over 10k. These lenses have leaf shutters in them that support flash sync to 1/2000 second. But more interestingly, Hasselblad claims that the hot shoe up top is Nikon-compatible. 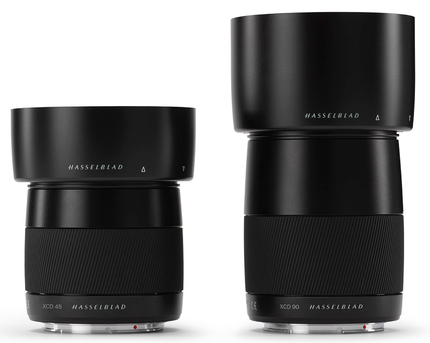 You can use Hasselblad H series lenses with an optional lens adapter. If you’re wondering about what 45mm or 90mm covers on the smaller-than-645 sensor, these two lenses are basically 35mm and 70mm equivalent (multiply the focal length by 0.79x). The next lens to be introduced at Photokina will be about a 24mm equivalent, I believe, based upon comments made by Hasselblad at the launch. The camera will show up in demo locations in July, with shipments to begin in August. The camera is built in Sweden. 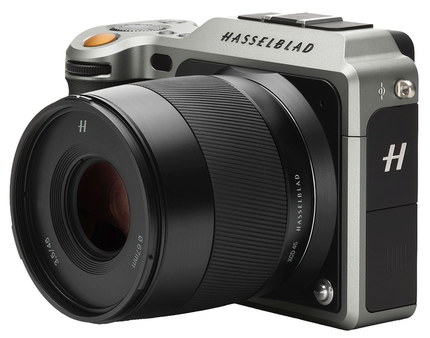 Clearly Hasselblad took a long look at what the market wants and what else is available. Smaller size, better sensor, simpler ergonomics/UI, keep the price as affordable as possible. Those are all present here in X1D. 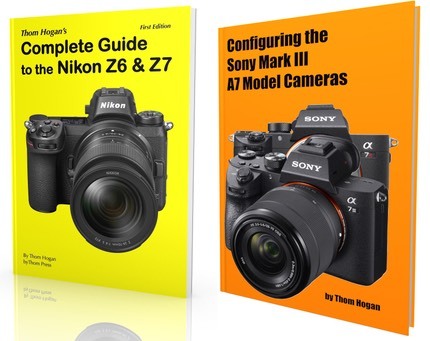 Indeed, even at more than double the price, Sony has to be worried a bit about the impact on their A7rII sales. The X1D is cleaner and leaner in design, has no big feature lapse (at least for still shooters), is not a lot bigger, and has that huge sensor with plenty of pixels going for it. As usual for any new mirrorless format, lens selection is sparse and relies a lot on adapted lenses initially, but that will change over time. Suddenly in medium format the Pentax 645D has a competitor in price, and one that is smaller and lighter. Suddenly full frame shooters are wondering whether they want a bigger sensor. Hasselblad has managed to make a high-end body that is desirable, at least at this early stage before anyone really has had a chance to shoot with it and discover its liabilities, if any. This is a long way from the Lunar and other rebranding experiments that Hasselblad was doing just a few years ago. Like Leica, Hasselblad seems to be rediscovering itself and getting back on the track it was once on: high performance, high quality, handmade cameras that pack a visual punch. The X1D is great for the mirrorless market, as it extends that type of camera into performance regions at the top of the camera heap. Welcome, Hasselblad. We look forward to testing your new offerings.